It’s now past midnight in Adak and the ‘boys’ are fast asleep. Sarah is catching up with friends and family but on her last reserves, desperate for some sleep. 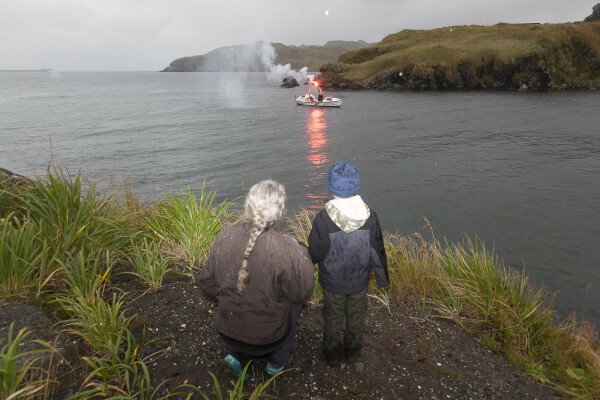 She thoroughly enjoyed her hot bath, home-cooked food and a fabulous welcome from the people of Adak. Work on Happy Socks will commence tomorrow while Sarah will have a quick medical checkup before getting to know the island and its community. Photos below from the adventurous James Sebright. More to follow but it may be a while as they all get their beauty sleep! P.S. The counter on the home page is still ticking away merrily but should have stopped on 150 days. It will be stopped later today. We are so impressed by your achievement!!! We are following you for a long time and are enjoying your blogpost immensly. Wish you all the best and a lot of rest, and hope to read about you soon. I had a sleepless night and I’ve never even met you! Congratulation to you and your wonderful back up team for keeping the web page so current and lively, it’s been addictive. Well done. Enjoy family, rest, good food and stable ground. So happy you made it to North America. Enjoy the changing scenery and the bike. From a Tokyo cycling friend. Wooh – the BBC news has just announced your arrival – you must really be there then(!) Still excited and on a high that you’re there and safe. Relax, enjoy – and start to look forward to meeting up with loved ones again. I can’t think of anyone who deserves it more than you! Have you started to miss Happy Socks and the Ocean in any way yet? Well done Sarah!! Enjoy your well deserved rest. Depending on your kayaking destination this coming spring perhaps we could paddle a bit together as your near shore Again, very well done! Thousands of Congratulations. You are always part of our day. It’s an amazing adventure and I’m sure the islanders are so proud that you pitched up on their land. Have a wonderful time. You’re safe at last. 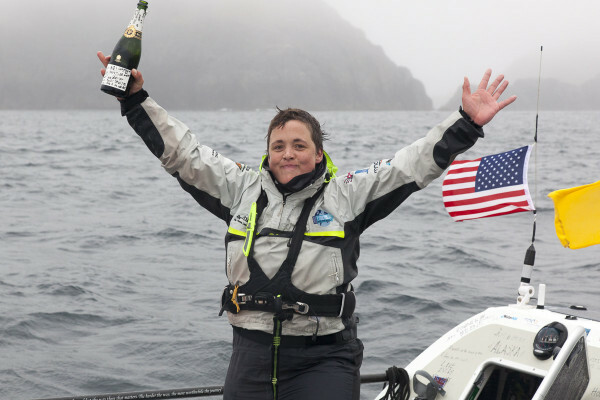 Congratulations Sarah and Co. What an incredible achievement! I had to excuse myself from work for a quick second to run outside and do a celebratory dance. Wow! Congratulations Sarah. When you get some rest take a listen to my comedy podcast Angr Old Man Podcast on iTunes or Stitcher, it may put a smile on your face and keep you company as you continue on your journey. Well done Sarah! 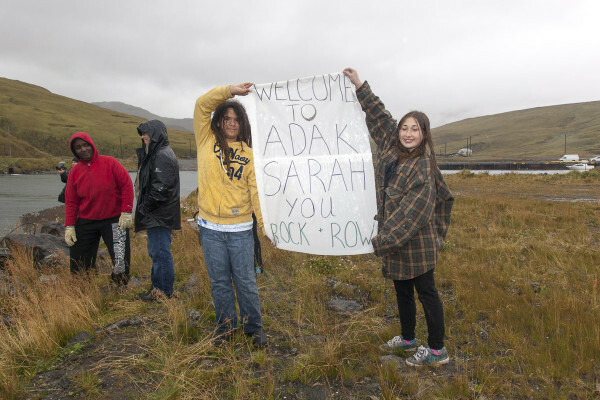 Sarah great to hear that you arrived at Adak safely. 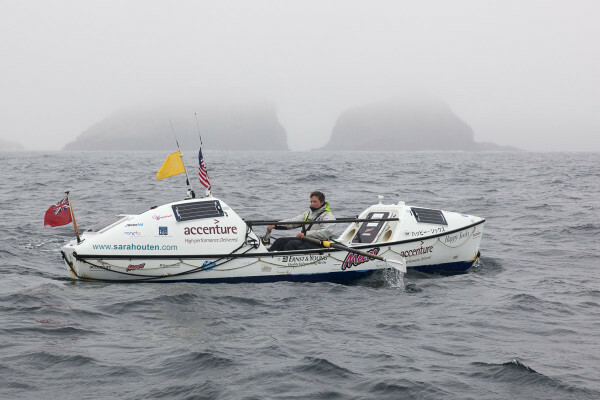 Fantastic effort, 150 days at sea in a small boat on you own amazing feat of physical and mental endurance. Hope you enjoy your rest and look forward to following you when you continue your journey in the New Year. Well done! So very well done! Stunned into disbelief as to your achievement, your Dad would be so immensley proud of you. What a fantastic achievement, another first for Great Britain. We are all very proud of you. Congratulations Sarah! Bet you are glad to be on terra firma for a while! Always a pleasure to catch up with all your messages. Well done! Many congratulations on your achievement!! Enjoy your rest and recuperation. Many CONGRATULATIONS!!! Very well done Sarah! Enjoy the comforts of terra firma! Bravo Sarah and Happy Socks! What a fine achievement for the record books. Congratulations on your achievement. No capsize this time remember Mauritius! Once again well done. Mike. has happened would you wish to be anywhere else. Fantastic effort Sarah!! Well done you are an inspiration to people around the world. Get some sleep now girl and look forward to the next leg of your amazing journey. I’m impressed when someone sets out to do something remarkable, whether or not the endeavor is ultimately successful. What you have accomplished is mind-boggling, particularly all the elements that went into it. Congratulations on a singular achievement and much luck as you carry (or more specifically I guess row) on. Wow wow wow! You are amazing! Rest and may you find so much strength in your wonderful friends and family who have been holding you all this time in their hearts. You have made what is unbelievable believable. So proud of your dream and your making it real. What a fantastic effort by a truly great lady. We feel so fortunate to have met you and spent time with you in Femantle. Love and all the best for the next part. Congratulations, the world cheers for your astounding accomplishment. Wow! You are in the Toronto Star Front Section! Again, such an amazing feat Sarah!! Congratulations!!! Wow!!! Maybe an unexpected route, but with a new great adventure ahead, the Aleutians. Welcome to Alaska! Good luck on the rest of your adventure! You were on the news of the national network TV in Tokyo! They said the secret of your achievement is your cheerful heart to find something to enjoy in everything that happens and showed a lot of photos and movies from this site. So very glad Sarah that you are now on dry land. Very well done my dear. You have a great spirit and show so much determination – truly and inspiration to us all. Enjoy the rest, company and good food. Many many congratulations from back in Japan. We’ve been following you all the way, Sarah. Have a great rest, and all the best for the next stage of your journey.